Add a little shabby chic to your home decor with this wooden freestanding butlers serving tray. Perfect for the living room, kitchen or dining room. Just what you need for serving breakfast in bed or using as an occasional table in the living room. 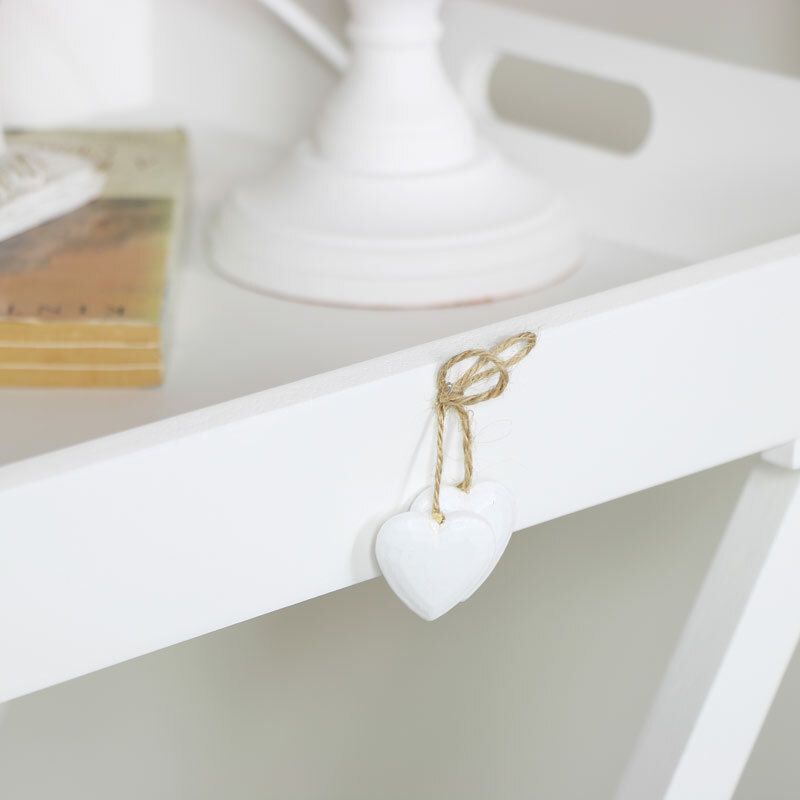 Designed with the French country style in mind, the tray features a pretty little hanging heart motif on the front. The tray easily lifts off the stand and can be carries with the cutout handles. Treat the one you love with breakfast in bed or carry tea and biscuits for guests and visitors. Add a little shabby chic to your home decor with this wooden freestanding butlers serving tray. Perfect for the living room, kitchen or dining room. Just what you need for serving breakfast in bed or using as an occasional table in the living room. Designed with the French country style in mind, the tray features a pretty little hanging heart motif on the front. The tray easily lifts off the stand and can be carries with the cutout handles. Treat the one you love with breakfast in bed or carry tea and biscuits for guests and visitors. Made from wood and painted in white. 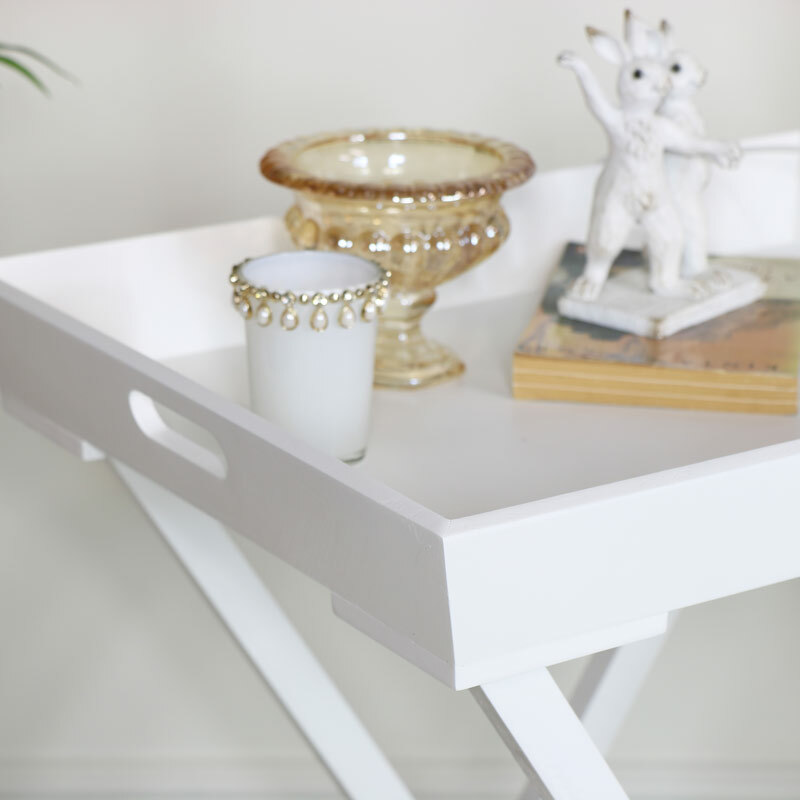 The tray lifts off from the stand which can be folded away when not in easy, making this a great space saver. We have the best selection of home decor and accessories with this tray being a great addition to our selection of freestanding and tabletop trays.